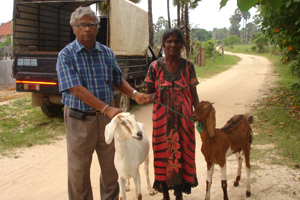 In 2012, ISLF launched a project to provide livelihood assistance to the “war widows” in the Kilinochchi District. The Sri Lankan ethnic conflict has created war widows and disabled persons. According to an ISLF need assessment study in the Kilinochchi District alone, there are about 6044 widows and 2436 disabled persons (ISLF, 2012). The overall objective of the project was to strengthen the livelihood of 210 widowed families (beneficiaries) over a period of three years in 14 villages in the Vanni region of the Northern Province by promoting dairy farming. The project was designed to be undertaken in three phases, namely: Phase I – Two villages covering 30 families; Phase II – Four villages covering 60 families; and Phase III – Eight villages covering 120 families covering eight villages. The 2012 Phase I Project was aimed at providing livelihood assistance to 30 “women headed” families by promoting dairy farming. This feature article is a case study of this project. According to the National Center for Technology Innovation (http://www.nationaltechcenter.org/) case studies allow researchers to fully understand how an intervention worked, or why an intervention had an effect in a particular case. In this case study we will examine the lessons learned from this project and will use the “lessons learned” to implement the Phase II of the project more efficiently. According to the Phase I Project Document, 15 women headed households from two villages in the Kilinochchi District would be the beneficiaries of the project. A budget of US$ 10,000 was provided to the Sewalanka Foundation to implement the project. Beneficiaries would be selected through an open and transparent participatory process. Each beneficiary will be provided with a young cow (heifer), preferably pregnant or in calf, free of charge. At the time of handing over the cow, Sewalanka Foundation would have to ensure that each beneficiary signs a simple “contract” which binds the beneficiary to meet certain obligations. One of the obligations is “passing on the gift” principle, which means each beneficiary will donate the 1st female calf produced by the cow to another family. The beneficiaries should belong to a formally established community organization. The project had allocated funds to provide micro-credit to beneficiaries. The cows to be donated are to be healthy animals and preferably improved cross breeds. The project would make sure that the beneficiaries have access to animal health services and will be able to sell the milk at competitive prices. Training will also be provided to the beneficiaries. Initially, the Sewalanka Foundation selected two villages in the Kandawalai Divisional Secretariat Division to implement the project. However, in order to comply with the Government’s request, the project was moved to two villages in the Pachilaipali Divisional Secretariat Division. The villages selected were Pulopalai West and Arasar Kerni. Beneficiaries were members of the respective Women Rural Development Societies. Beneficiaries were selected through a participatory process of “interview” in which the ISLF and Sewalanka Foundation representatives, Chairpersons of the Rural Women Development Societies and the respective Grama Sevakas participated. During the interview, it became evident that many eligible women headed households will not be entitled to receive cows because of (a) their lack of experience in dairy cow management, (b) lack of physical facilities in their homesteads for managing cows; and (c) lack of interest to own and manage cows. A number of beneficiaries requested livelihood assistance in the form of goats and poultry. A few “deserving households” requested assistance to start house-hold businesses such as sewing cloths and grocery shops. Eleven (11) Jersey cross bred cows were bought from individual farmers in the Gampaha District and were transported to the project site. The cows were donated to eleven beneficiaries during a cow donation ceremony held in October 2012 in which the Local Government officials, ISLF and Sewalanka representatives, and members of the two Women Rural Development Societies attended. Each beneficiary signed an agreement which stipulated, among others, that she will donate one female calf within a 3-year period to another household. Twelve (12) cross bread [cross bred with Yamuna Pari (long-eared goat)] she-goats were donated to six beneficiaries in November 2012. Sewing machines were donated in January 2013. Chickens and small business loans are scheduled to be delivered in February 2013. Download Full Document of "Livelihood Assistance to Women Headed Families in the Kilinochchi District"